From being an emerging app that allows sharing photos of puppies in vintage-themed filters, Instagram has transformed into a marketing tool that savvy businesses ought to have. The photo-sharing giant now has more than 500 million users, making it an ideal online marketplace. Most businesses have an account, and those that know how to create and promote compelling content can benefit from more than just having a handful of filters at their disposal. This simply means providing a convenient path in which your followers can buy the products posted on your page. With a shoppable Instagram tool, you can direct users to your online shop where they can make an actual purchase. Instagram is, arguably, not the best ecommerce platform to use if you depend on clickable media, but if you know how to tweak the app to your advantage – and provide an attractive presentation of your products – you can turn likes into sales. Entice followers to engage with you and share content with incentives such as discount codes or coupons. You can do this by running contests with an interesting concept, cool prizes, and a sharing or voting element that encourages participants to share your content with their friends. 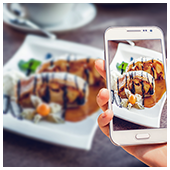 Better yet, engage followers by tapping into user-generated content via photo contests, resulting in free promotion for your brand. Instagram doesn’t exactly have the most mobile-friendly CTAs, but don’t let this prevent you from sending followers to your sales page. Whether it’s telling them to go to the link on your bio or simply incorporating a shoppable Instagram feature on your page, specific instructions on how to buy or know more about your product can spell the difference between making a sale and getting ignored. Post photos using stylish filters, create snappy and quirky videos, or let your followers take a friendly behind-the-scenes peek at your organization using the Stories feature. Come up with a catchy and relatable caption that encourages participation and engages your core audience. Also important: using hashtags on your posts. Any business Instagrammer worth his or her salt knows that a simple hashtag can pave the way for other users to reach your content and, ultimately, buy your product. Remember that Instagram is a visual platform, and as such, users are enticed by striking images rendered in flattering filters, vivid colors, and clear messages. Although other social media platforms such as Facebook and Twitter are excellent mediums for promoting products, the image-oriented nature of Instagram brings in a wealth of opportunities for promoting your brand. Aside from coming up with likeable posts, crafting a clear and concise caption can lead to a winning Instagram marketing campaign. With some creativity, visual flair, and a well-defined strategy, these tips can help shape your Instagram feed as an attractive online sales generator. If you need further advice on how you can make the most of your social media presence, contact us and we’ll be happy to help.